Editors Note: Today's post is brought to you by our intern-extraordinaire Emily Walker. Emily has been on fire this summer, always a few steps ahead of us and able to proactively make office life at SEQ that much easier. From obsessively organizing our event materials, mastering excel spreadsheets with ease, processing research projects in a speedy (but thorough) fashion and accompanying us on client meetings - it would certainly appear that we don't oversee coffee runners here! Emily's last day is this Friday, and we couldn't be more sad to see her go! However, with only one semester left until her big graduation day - we know it won't be long before we see her again! Best of luck Emily - thanks for being such a rock star! 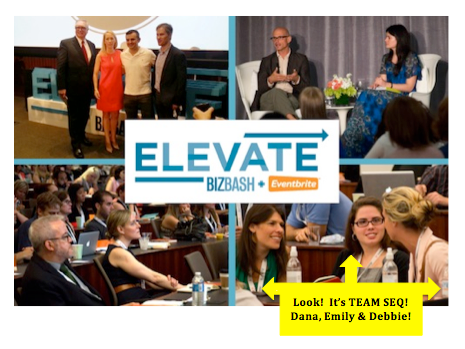 Last week, Team SEQ went to ELEVATE, a one-day conference about technology, social media, and marketing for events (brought to us by BizBash and Eventbrite – thanks guys!). The day was filled with tons of different speakers who gave AMAZING insight on social media and events. The funny thing was, there was one phrase that kept popping up over and over again, no matter who was speaking: “Tell the story"
Choose the Best Channel of Communication – If you wouldn’t actually read the e-blast you’re about to send, don’t expect that others will too. Same goes with advertising your event through constant e-vites, facebook posts, Times Square billboards, carrier pigeons – you name it. Know your audience and tell the story in a way that they will surely notice and listen. Make it Short & Sweet – In today’s noisy world, people barely have time to read a tweet! Even if they are paying attention, they probably have their TV, iPad and iPod all on at the same time (I’m listening to music as I write this and have already checked my email twice - hey! I'm multitasking-- right?). If you want the story to be heard, you have to grab your audience’s attention in the first glance and get to the point before they move onto the next thing. What have been your best, craziest, out-of-the-box “tell the story” moments? Doesn't matter when it occurred during the planning process- before/during/after a recent event -- spill the beans!